Not a lot of beer this week. The fresh hopped Wild IPA from Powell Street was nice. Pleasant mix of all the hop derived fruit flavours with a bit of funk. Not too grassy and just enough tongue tingle from the wild yeast. No where near as grassy as that Phillips Six. Someone described that flavour as a lawnmower that was let loose in an asparagus garden. Well said. That leaves my budget at about $132. I did visit Noble Pig brewing in Kamloops. The food was well above average and the beers matched. Nothing exciting but all solid. Their mocha porter was the highlight beer. Red Collar brewing down the road had lots on tap, but not much worth drinking. After a few unappealing samples, a growler of mild of obtained. Was a decent English mild. Toasted, fruity malts tempered with a surprising herbal hop snap. Very seasonable at under 4% ABV. These were parental sponsored events and will not affect budget, YAY. So what to blog about? Maybe glassware. I admit that I have a glassware problem. I'll let you in on a little secret. Most beer glasses do nothing to enhance drinking enjoyment, they are pretty forms of advertisement. 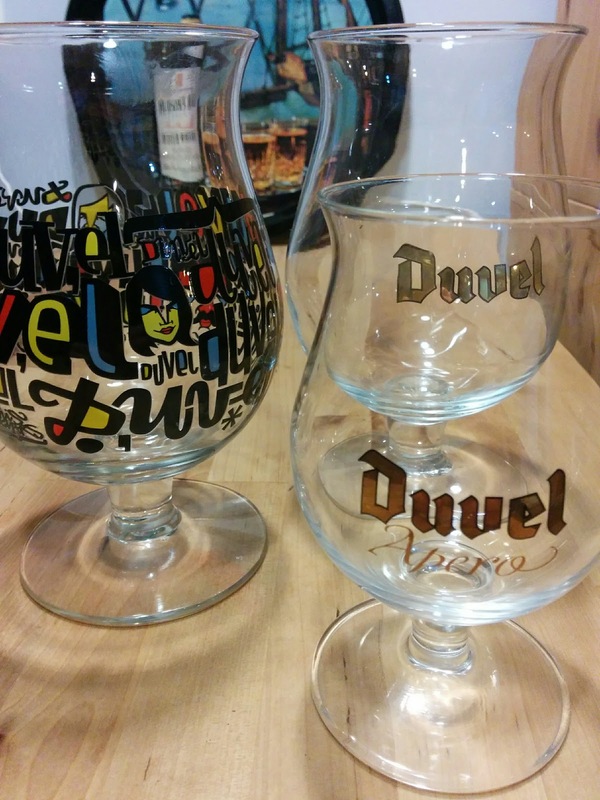 My go to glass is the Duvel tulip. Any serious beer geek should have a tulip. 1. It is easy to clean. 2. The bowl shape holds almost a full bottle and traps the aromas. 3. Its convex lip can hold support a large foamy head. It covers the lower lip to prevent contaminating flavours from food or lip balm. Also prevents the dreaded beer slobber. 4. The large foot and short stem lowers the center of gravity and makes it almost impossible to tip over. 5. The bowl fits the hand nicely. 6. There is a nucleation point for proper head and aroma production. 7. It just looks so damn cool. If you don't have a tulip, use a snifter instead. They are very similar, except for the convex lip, and can be found everywhere. In a future post, I should mention the glass I like the least, it might surprise you. 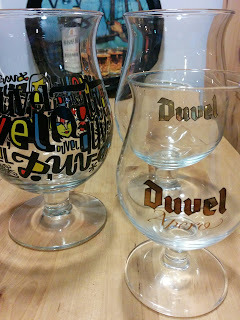 Duvel a is also mÿ go to. Oddly I like their glassware but am not terribly impressed by their beer? I find too many breweries get inspired and creative about cool bottles, glassware, growlers and bottle openers - yet not enough on their beers. Why is this? Are accessories a big beer market?